This fabulous complex is being built on the lush foothills of the Five Finger Mountain Range in Bahceli region with panoramic 180 degree views of the mountain range behind. There is a beautiful beach just five minutes away from the complex, and an international golf club nearby. There will be a large communal swimming pool with a nice seating area in the complex. This amazing complex offers a prime location holiday home or investment property for all walks of life. As an owner of this perfect 2+1 apartment, you can be confident of knowing you have a secure investment for the future with fabulous facilities. This wonderful two-bedroom apartment will have its own private terrace and an access to a nice and blooming garden, where you can enjoy the sun all year round. There is a work top and stainless steel sink in the kitchen, fitted wardrobes from floor to ceiling in the bedroom, toilet unit and shower in the bathroom. You will be able to purchase an extra package with furniture and some white goods for 8.200 GBP. There is an interest-free payment plan available with 25% downpayment. You can purchase an extra package with furniture and some white goods, including 2 a/c inverter, oven, washing machine, fridge freezer, L-shape sofa bed, coffee and dining tables and chairs, a mattress, and a few more items. 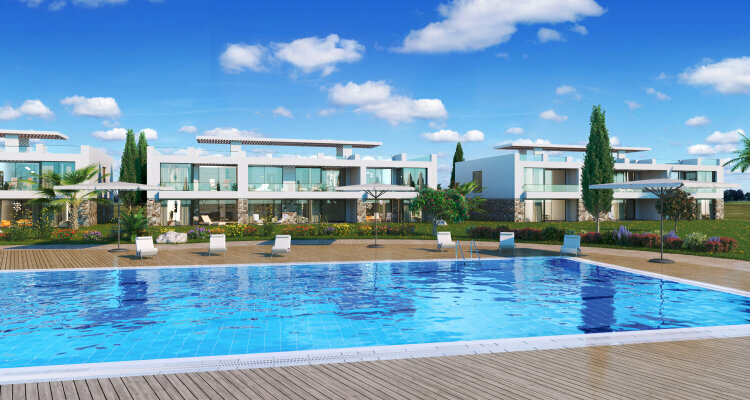 Owners will have easy access to a beautiful beach and the outstanding new 18 hole Korineum Golf Course and Country Club with its golf, restaurant and spa facilities (10 minutes).